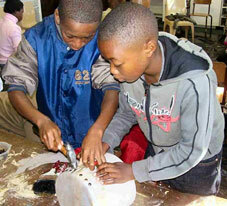 Get the Rhythmania Team into your school to run a drum building workshop with your learners. It is suitable for Grades 5 (11 years) and up. Rhythmania will provide all raw materials and tools; will facilitate the drum building process and drumming once the drums are finished. 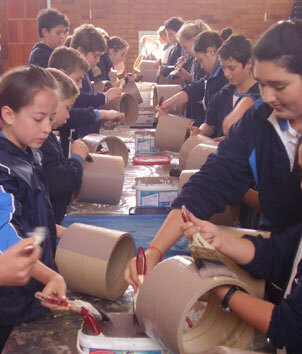 The learners can either decorate their drums as part of the workshop or at a later stage depending on the availability of time. 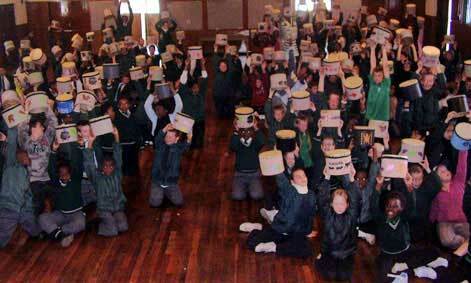 Rhythmania will happily come and facilitate an interactive drumming workshop at your school. All drums will be provided. This can either be done with individual classes or entire grades (although there is a limit to how many learners can be accommodated). This course is applicable to any grade. Rhythmania has tailored many games using the drums to stimulate and improve concentration levels, listening and auditory skills, group work and gross and fine motor skills. This course works best with individual classes or with groups of 30 or less. Using brightly coloured melodic plastic tubes, the Rhythmania Team will facilitate a session of energetic rhythms and games. This can either be done with individual classes or entire grades (although there is a limit to how many learners can be accommodated). This course is applicable to anyone and everyone. 40 minutes per grade or class. Max 3 grades/classes. If drumming is already established at your school why not get the Rhythmania Team in to do a workshop on composing an ensemble. This workshop uses slightly more advanced rhythms and a variety of traditional percussive instruments. This workshop is aimed at Grade 4 – 9. 60 minutes or more depending on your needs. Rhythmania will come to your school to work with your foundation phase teachers for an afternoon. The course covers rhythmic and percussive games which can be used to enhance co-ordination, concentration, auditory skills, self esteem and social skills. Course notes are included. 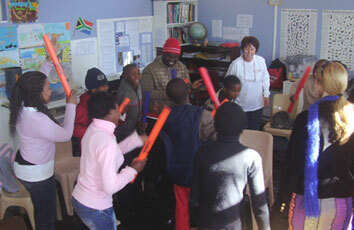 Boomwhackers are brightly coloured melodic plastic tubes. Come and spend the morning with us and we will show you how versatile these tubes are. They can be used across the curriculum to enhance a whole range of learning outcomes. This course is applicable to anyone and everyone who would like to enjoy themselves while learning how to use the Boomwhackers for much more than the making of music.